Find a very big jar. Make sure it is not plastic, as the ghost needs to go into the oven. Should be thick glass. Smear the glass inn with butter or some fat. Attach bakingpaper around it. This is so that we can remove the Ghost easily afterwards. 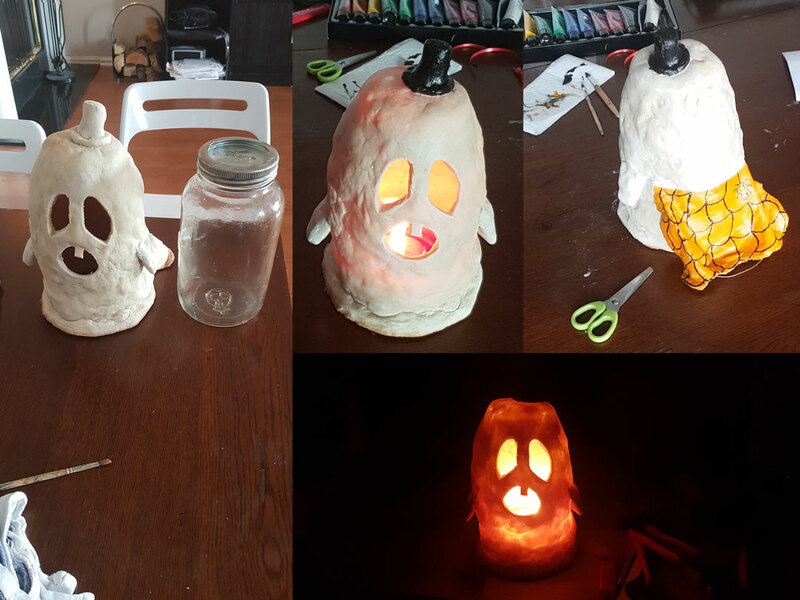 Use Troll Dough to build up the Ghost. If you do not know how to make Troll Dough, please check out this tutorial. After you have built the Ghost, use some steel wire to attach the arms and the cape. Wooden sticks or toothpicks will also do the trick. Cut out the eyes and mouth using a knife. Put it in the oven at 180 degrees Celcius, and let it harden. Depending on how thick you made it, the longer it takes. If it makes a thump noise when you poke it, it is not finished. If it makes a clonk noise when you poke it, check another place. If the whole thing is hard, take it out. After it has cooled down, you can start painting it. I used Acrylic paint, which worked out very nice. Step #5: And you are done! Light a candle and put it underneath the Ghost. The whole Ghost will shine up!